Stainless nonstick cookware is a new trend gaining popularity. Manufacturers today have uncovered the secret to bonding a nonstick coating to stainless steel. The end result is quality cookware that is easy on the cook, attractive and easy to clean. Nonstick surfaces are usually only applied to stainless steel skillets. 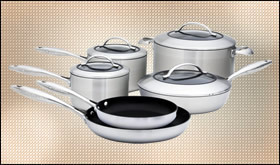 A few brands, like the Scanpan CTX product line, are complete stainless nonstick cookware sets. Quality stainless steel, 18/10 construction, clad with aluminum or copper on the inside, has been a favorite of chefs for a long time. Households on the “go” have enjoyed the advantages of nonstick surfaces like Teflon and T-fal. In the past, it has been difficult to bond the nonstick surface to stainless steel cookware because of its smooth non-porous surface. Today that has changed, and manufacturers are producing lines of cookware blending this powerful combination. Stainless steel is an attractive cookware with its shiny or brushed surface. The outside is easy to clean in the dishwasher, by hand washing with warm sudsy water, or a stainless steel cleaning compound. When clad with aluminum or copper, the stainless steel cookware produces precise heating control and even heat distribution. Busy cooks who do not want to spend much time scrubbing their cookware opt for a nonstick surface. Quality nonstick surfaces are produced with multiple layers and a bonding layer for durability. As with most, but not all nonstick surfaces, the use of low to medium heat is essential. Do not use metal or sharp utensils on most nonstick cookware. Today several quality brands have products available. The Calphalon Contemporary line has a brushed stainless steel exterior with a light colored nonstick finish on the inside. Farberware has their Millennium line. Anolon has select pieces. As these lines become popular, and the advantages of this powerful combination become known, more manufacturers will introduce product offerings. 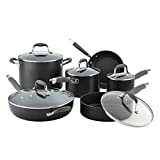 My favorite by large measures is the Scanpan CTX stainless nonstick cookware set. It is chef grade premium cookware that can be used at higher heats, dishwasher safe, and a real joy to cook with (picture above). Cooks now have access to a cookware with a powerful blend – stainless nonstick cookware. Excellent heat distribution of clad stainless steel with the ease of use of nonstick interior finishes makes a tempting combination.